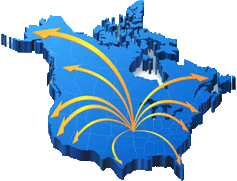 Self-Operating Regulators | De-Mar Inc.
60 Year distributor/representative of H.O. Trerice industrial products! The Trerice “self-op” temperature regulator is a fully self-contained unit requiring no external power source. Single and double seated valves designed for heating, cooling, mixing, or diverting applications. Valve bodies are available in bronze, cast iron, steel, and stainless steel. ½” NPT to 2″ NPT and 2 ½” flanged to 6″ flanged. Valve coefficient (Cv) is supplied for all units to properly size the correct valve for the application. The thermal system (sensing bulb and capillary tubing) is available in copper (for best heat transfer) or 316 stainless steel. The thermal system can also be supplied with a variety of protective coverings. Capillary tubing lengths can be supplied from 8 to 52 feet. Carbon steel, brass or stainless steel thermowells available for all bulbs. 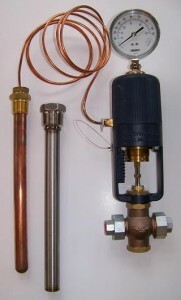 91000 actuators are non-indicating style and are stocked in Overland Park, KS in common temperature ranges with 8 feet of capillary. 91400 actuators are equipped with a dial thermometer and are also stocked in common temperature ranges with 8 feet of capillary. Local stock, factory stock, or built to order for special applications. 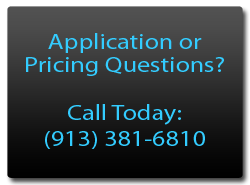 Call today with your application! The Trerice 910 series pneumatic control valve offers high quality at an economical price. 7″, 9″, and 12″ actuators are offered for On/Off control, proportional control, PID control, or throttling flow response when used for 3-way applications. Valve bodies are available in bronze, cast iron, steel, and stainless steel. ½” NPT to 2″ NPT and 2 ½” flanged to 8″ flanged. Valve coefficient (Cv) is supplied for all units to properly size the correct valve for the application. Pneumatic control signal required at 15 PSI for On/Off and 3 to 15 PSI for throttling and proportional. 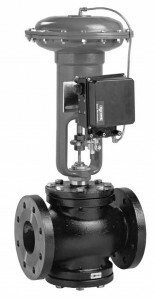 Heavy duty control valve also available in 14″ and 17″ actuator size for extreme and demanding industrial, HVAC, and commercial process applications. Electropneumatic (I/P) transducer available to convert 4 to 20 mA signal to corresponding air pressure. Factory stock on components for assembly and quick shipment!